Every once in a while I read a book that makes me go, Dang, I want to be able to write like this author does—as economically, as unpredictably, as gracefully. It tends not to matter so much what the content is, and in fact, the last few writers who’ve affected me this way have been Michael Ondaatje, Rachel Cusk, and Tamar Adler. My dear friend Madeleine gave me Tamar Adler‘s An Everlasting Meal: Cooking with Economy and Grace for my birthday last month and I devoured it the following week. Adler formerly cooked at Chez Panisse, was an editor at Harper’s Magazine, and is now a columnist for the New York Times Magazine. Her book’s subtitle could have been: writing with economy and grace. 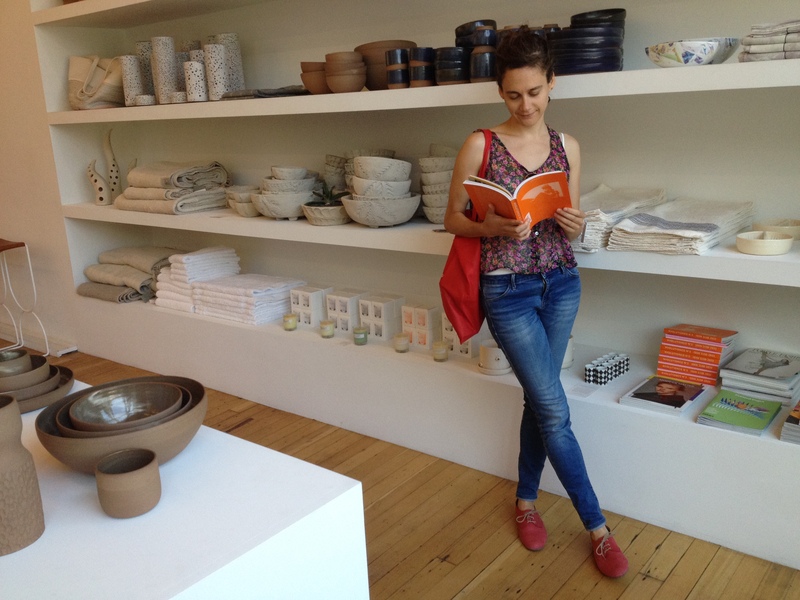 She writes like she cooks—unpretentiously, no panache, no gotchas. To me it seems that most writing about food these days, especially in the pages of magazines and blogs, not so much in books I suppose, is an all-too-clever, winking, gotcha! tone. We get it, you’re funny; you could be an ad copy writer; you’re smart and I’m smart and we all have impeccable taste in food and style, bla bla bla. Well Adler is none of those cloying things. Instead she’s all: here is how to boil your vegetables, use parsley, turn leftovers into better leftovers, cook meat, make soup. It’s an old-fashioned kind of mentality and tone and I mean that in the best possible way. The book, basically, instructs how to get good at the act of cooking and all the simple but important preparations involved in doing so. In all the food writing I’ve read over the years, hers is integrating into my being in a way others haven’t. In the past few weeks I’ve already wasted less food and made better meals than I have all year. Yesterday, on a blustery early April afternoon in Brooklyn, I ventured to make her rosemary olive oil cake, which she adapted from Cooking by Hand by Paul Bertolli. It was subtle, herbaceous, moist, and would go perfectly with a cup of Earl Gray tea or an espresso. Here you go. You’re welcome. *You may be thinking 4 tbsp sounds like a lot. I only had 3 tbsp so I used that and the rosemary was subtle and in fact I think 4 would’ve been better, so be bold! Butter and flour a bundt pan. Beat the eggs in a large mixing bowl for 30 seconds with a handheld beater. Slowly add the sugar and continue beating until the mixture becomes foamy and paler in color. Still mixing, slowly drizzle in the olive oil. Then fold in the rosemary. In a separate bowl, combine the flour, baking powder, and salt. With the mixer on low speed, gradually add the dry ingredients to the egg mixture, and then pour the batter into the bundt pan. Bake for 45 minutes to an hour, rotating the pan halfway through. Mine took closer to an hour. The cake should be golden brown and a skewer should come out clean. Allow the cake to cool briefly in the pan then gently tip it out to cool on a rack. This would be delicious with unsweetened whipped cream, or smeared with a bit of honey. Makes great breakfast leftovers the next day. No doubt chia is trending. By now you’ve probably heard it’s packed with fiber, omega 3 fatty acids, and, like flax, can be used as an egg substitute for vegan baking. I love it for breakfast, a late-afternoon snack. It’s the new oatmeal. Or yogurt. Or something. The gelatinous quality of the gel, which is formed by combining the seeds with liquid, slithers and satisfies, but may not be for everyone. My stepmother, when I texted her a photo of the pudding, asked if it was for eating or facials. It took me a while to drink kombucha with chia seeds but now I like the slimy seeds sliding down my throat. There are infinite substations you can make here, using your favorite spices, berries, sweetener. You could add pepitas, almonds, sunflower seeds; cardamom instead of cinnamon; agave instead of maple syrup. You can add more or less vanilla and cinnamon, to taste. I make this pudding incredibly not sweet, and I’ve had some with no sweetener at all—both are good. Adjust to your taste. You want approximately 1 cup of liquid per 1/4 cup of chia seeds — and beyond that you can decide what kind of milk to use, or yogurt. I like the combination here of almond and coconut milks. Oh and since the ground is still frozen here in New York, and berries are a mere dream of a food I once tried long ago, I used frozen blueberries here. Worked like a charm. Now thaw, ground, thaw. In a blender combine the almond milk, coconut milk, vanilla extract, cinnamon, and maple syrup and blend just until smooth. Place the chia seeds in a medium-sized bowl and add the liquid mixture. Stir until combined and let sit for a minimum of a half hour, or as much as overnight. 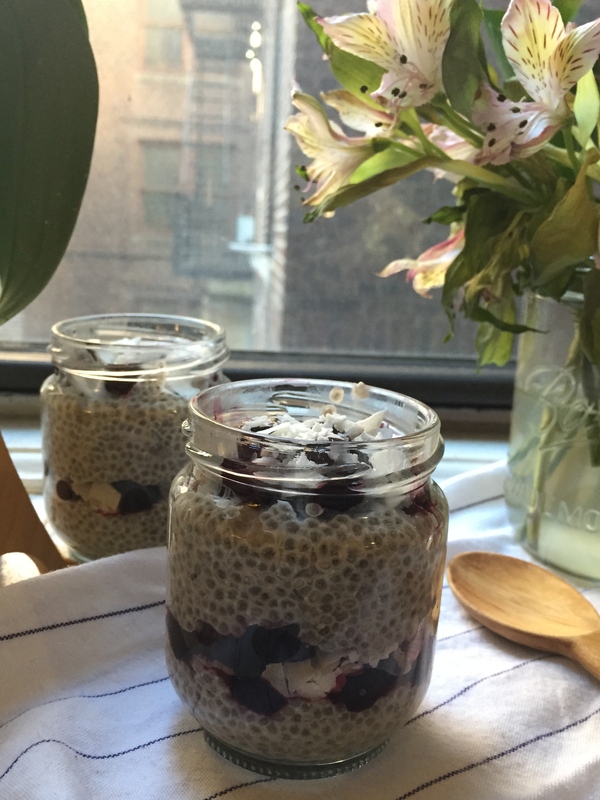 To serve, transfer to a bowl or small jars and layer with the blueberries and coconut chips. Keep refrigerated and eat within a few days. 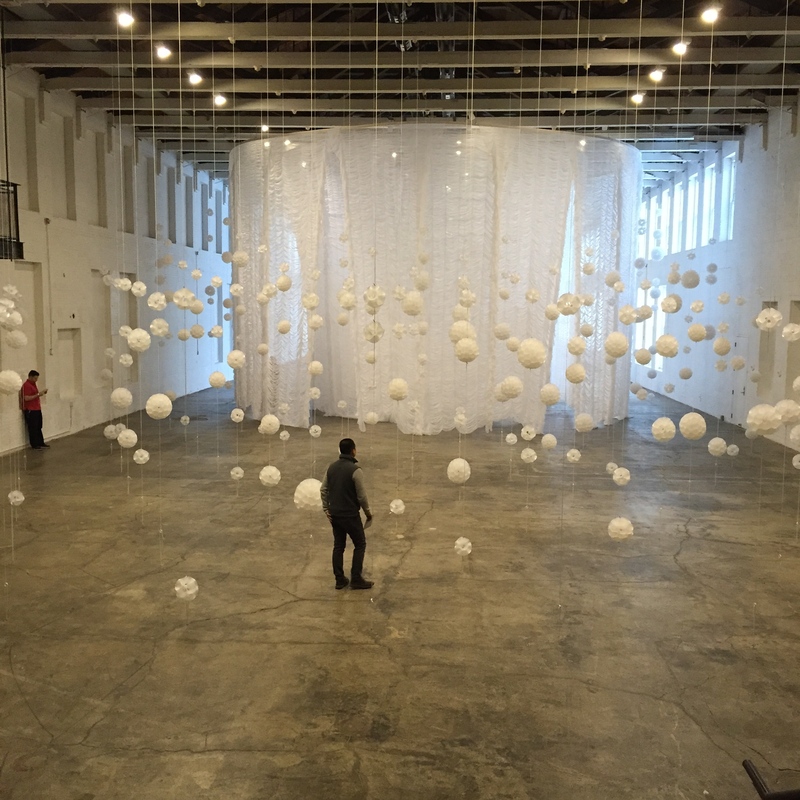 Pic below from an exhibition on plastic at Mass MoCA in North Adams, Mass. 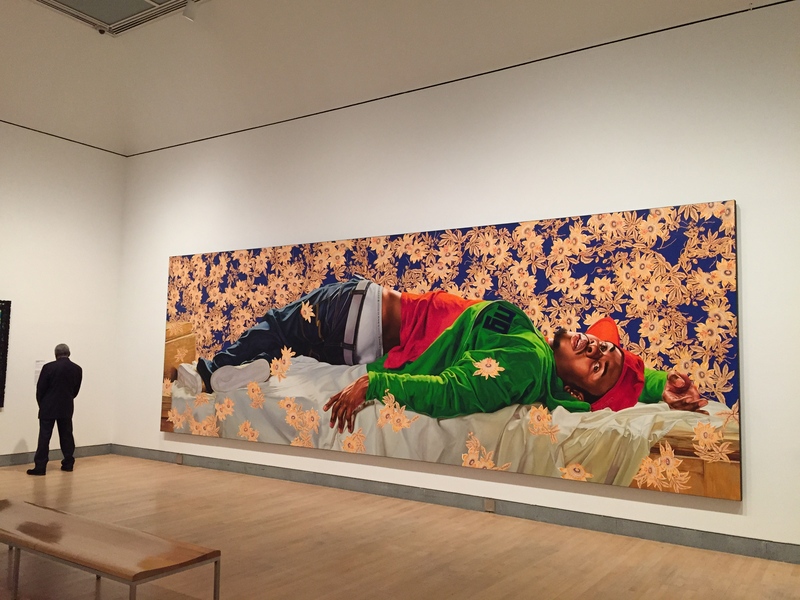 Kehinde Wiley show at the Brooklyn Museum, opened last week. 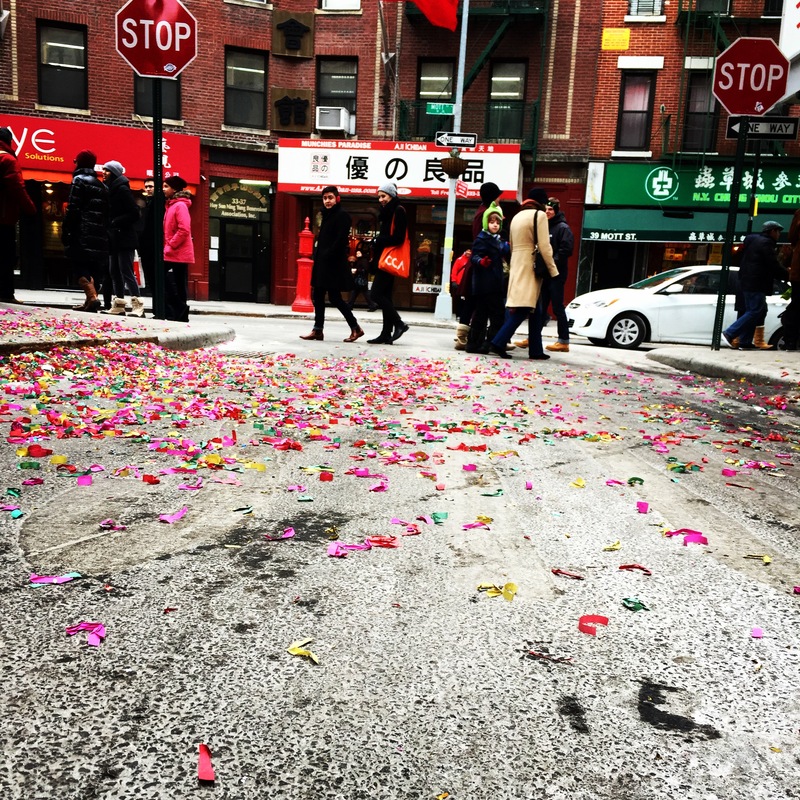 Chinese New Year, on Pell Street in New York’s Chinatown last weekend. 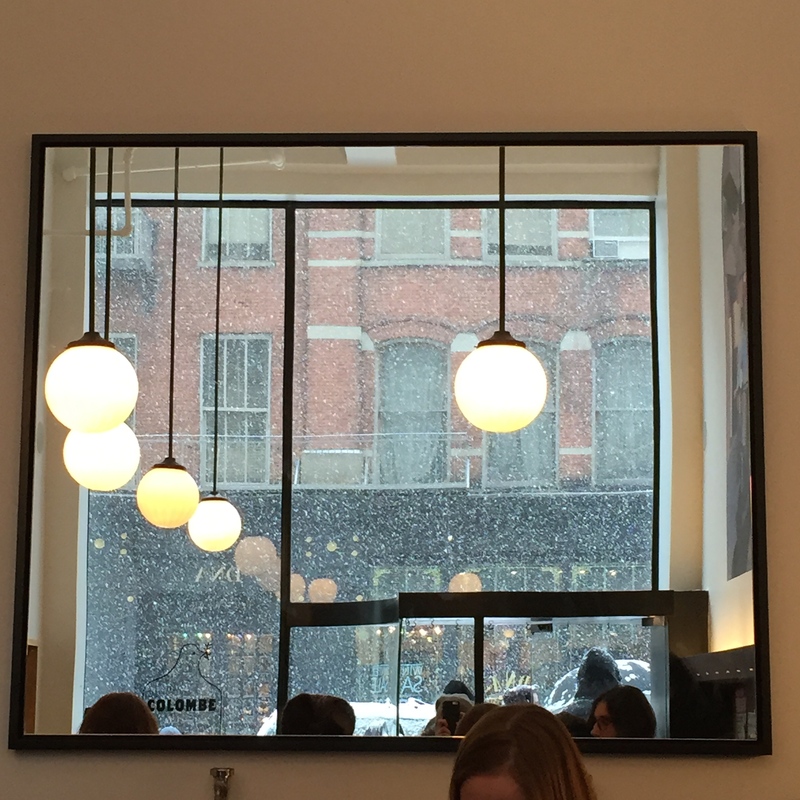 Snow reflecting on the mirror inside La Colombe, some of the best coffee in town. Lafayette Street, New York. Wow, August has been such a fulfilling and busy month. Somehow my last post was four weeks ago from Vermont! I stayed in that lovely state for nearly two weeks, came home for less than week, then was in Seattle for eight days. 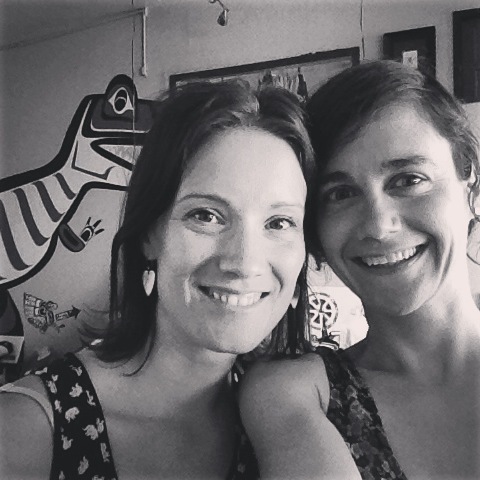 And now I’m in Philadelphia, celebrating my sister Emily’s 30th birthday, along with our older sister Hope. Traveling is good for my soul, less great for blogging. I wasn’t about to show up in Philly empty handed so a birthday treat was in order. Cupcakes? Nah. A regular ole flour-based cake? Seemed uninspired. 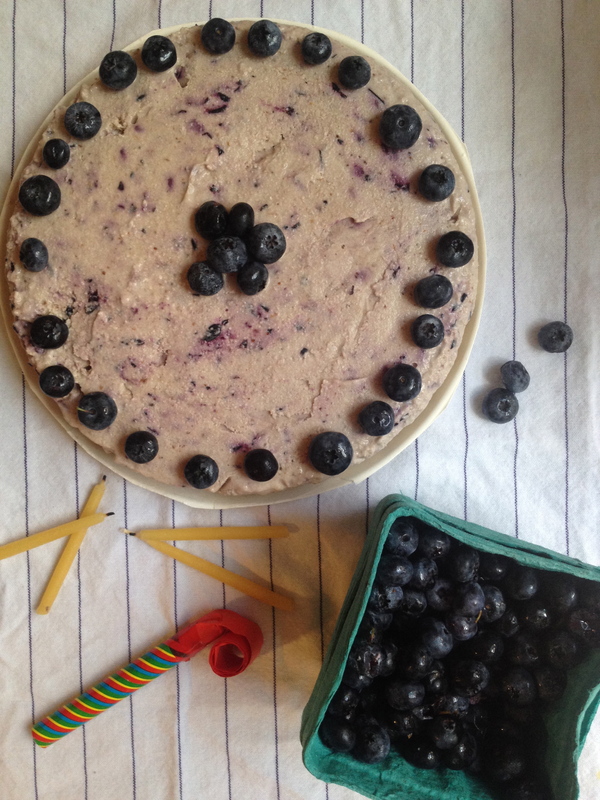 Blueberries are still in season and I’ve been interested in exploring more vegan and raw desserts so I turned to Emily von Euw’s blog, which has become one of my favorites to explore lately, and sure enough, got inspired. Like a lot of raw and vegan desserts, this cake takes its base from a combination of nuts, coconut oil, and sweetener (in this case, maple syrup). And like a cheesecake, this cake ends up tasting creamy and rich, with strong overtones of the cashew flavor. It is freaking good. 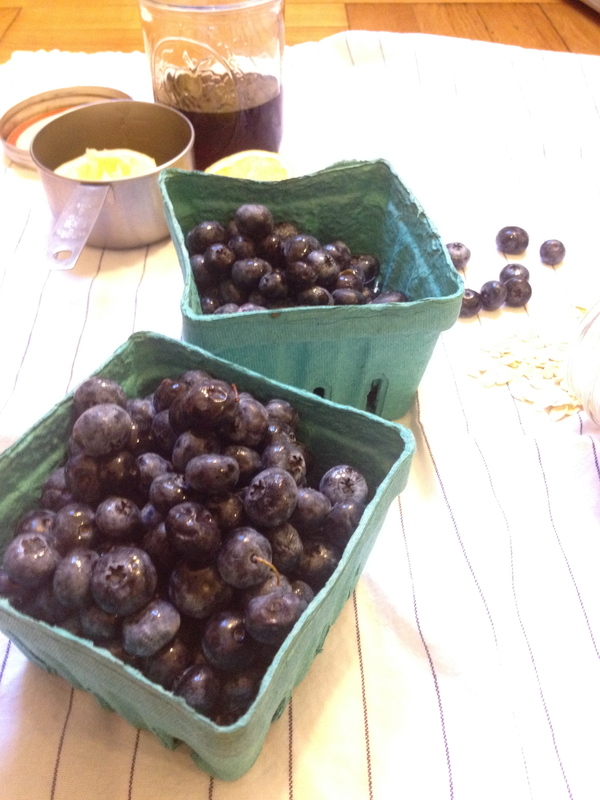 Find some local blueberries and keep that oven off. This was super easy to make and garners lots of “oohs” and “ahhs” and “wow, it’s vegan and raw?” And gluten free, as long as your oats are. So almost everyone can eat this cake! To make the crust: you’re essentially making oat flour out of your oats. Process in a blender until you achieve a pretty fine texture. If using a food processor or a blender with blades like a Ninja blender, then add the dates and maple syrup and process until it becomes one sticky mass. If using a regular blender, you will want to transfer the oat flour to a bowl and add the dates and maple syrup, mashing with your hands until it becomes a sticky dough. Then press the dough into the bottom of an 8-inch cake pan to form a crust (a springform pan would probably work great, but I don’t have one). I placed a large piece of saran wrap as a liner in my cake pan, underneath the oat crust. Chill in the refrigerator while you do the next steps. 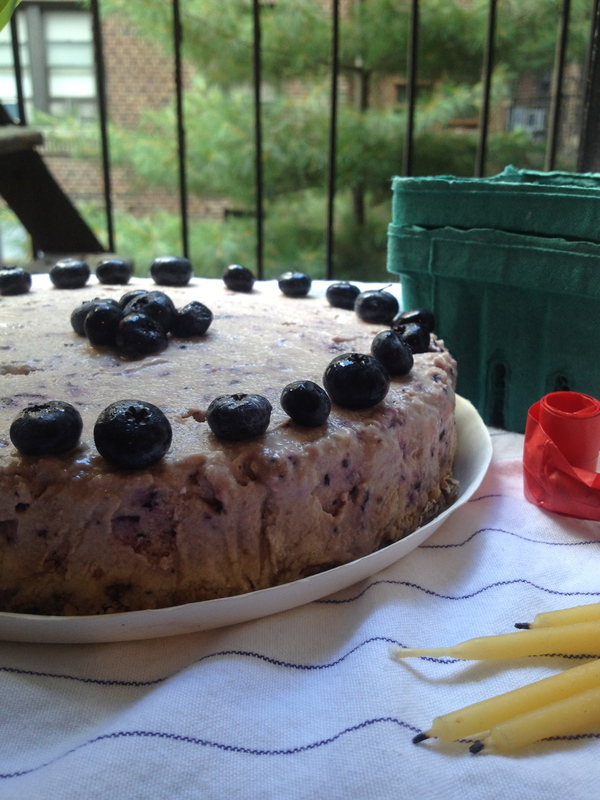 To make the filling: blend everything together except the blueberries until it forms a thick and creamy mixture. Mine was a little watery so I added approximately two tablespoons of oats and re-blended, which helped. But go easy on that cup of water, start with a little less perhaps so you can judge the consistency. Poor half of this mixture onto the chilled crust in the cake pan. Then place one cup of the blueberries on top of this layer. Blend the remaining cup of blueberries with the remaining filling and process until smooth. Poor this on top of the blueberry layer. Chill in the refrigerator until it sets (a few hours at least), or you can place in the freezer, which is what I did, since I had to transport it to Philly. We made it. Here are some Seattle photos from last week. 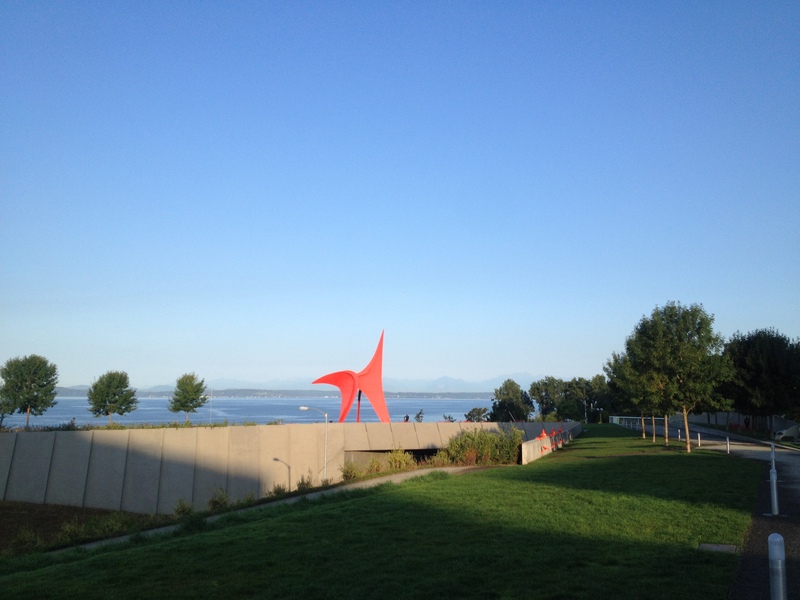 Olympic Sculpture Park right after sunrise. 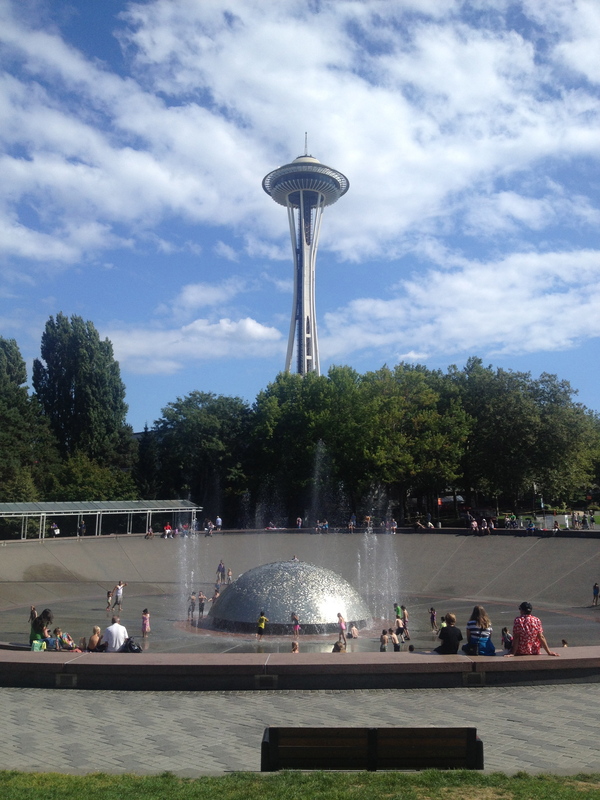 The International Fountain, in the shadow of the Space Needle. Kids love this place! 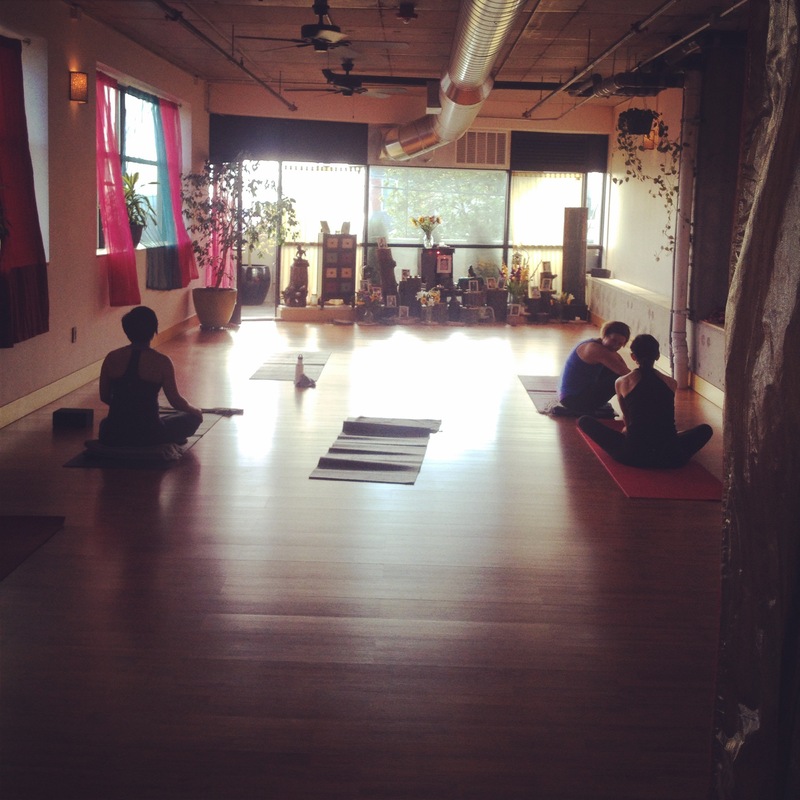 The Samarya Center, a yoga studio recommended by my teacher back home in New York, had the sweetest class there with founder Molly Lannon Kenny. Loved this store in the Capitol Hill neighborhood of Seattle called Totokaelo, a mashup of clothing, pottery, art journals, textiles, lighting design, and shoes. Found my friend Paul’s journal Convolution there, above, in orange. 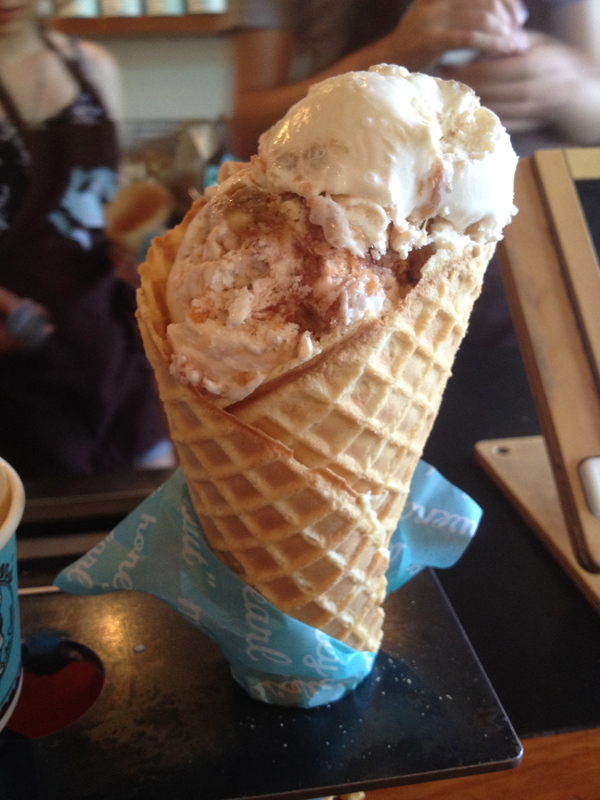 Molly Moon’s ice cream. Had maybe the best salted caramel I’d ever tried. Their waffle cones are made to order.